What is usually thought about when one hears the term, “dental cleaning” is the preventative, professional teeth cleaning you are supposed to get twice a year when you visit your Upper Manhattan best dentist. However, that is not the only type of professional teeth-cleaning that’s performed at your dentist office. Periodontal cleanings are also done but for different reasons. Dental cleanings and periodontal cleanings are both professional cleanings that are done at a quality Upper Manhattan best dentist office. The goal of both types of teeth-cleanings is to achieve good gum health but that is the only similarity among them. However, the main objective of each is completely different. Prophylaxis is the routine teeth cleaning you get every six months by your hygienist. It is done to help maintain good dental health and to prevent potential oral health future problems from happening. This type of cleaning is only performed on patients who are in a state of good oral health. There are certain criteria that needs to be met to get a regular professional teeth-cleaning. To qualify to get it, the patient cannot have any bleeding nor any mobility of teeth, receded areas or exposed teeth. During prophylaxis a professional hygienist will use a special dental tool to remove plaque, tartar and other substances from the teeth and gums. This helps to prevent periodontal (gum disease) from ever developing. However, if a patient has periodontal disease, she will need to get a periodontal cleaning (which also called periodontal maintenance). Unlike prophylaxis which is done for preventative reasons, the periodontal cleaning is done to treat periodontal disease. This deep cleaning is usually performed by a periodontist instead of a hygienist and is done to thoroughly clean the teeth to stop periodontal disease from progressing. Periodontal cleanings usually need to be performed about three or four times per year, but this will vary from patient to patient. To learn more about teeth cleanings, you should consult with our expert hygienist. Call our Upper Manhattan best dentist office today to set up your appointment. This entry was posted in Dental Cleaning and tagged best dentist, Dental cleanings, dentist office, periodontal cleanings, Upper Manhattan on September 30, 2018 by admin. Are you seeking information regarding a local South Bronx implant dentist? Give us a call at the practice of Dr Darryl Lieberman and book an appointment to discuss possible dental solutions with one of our specialists. At the office of Dr Darryl Lieberman, we’re proud to offer the best dental care to our fellow members of the South Bronx community and beyond. Our friendly staff of trained professionals uses state-of-the-art equipment and advanced techniques from the cutting edge of our field to ensure that our patients receive the highest quality care in an environment that’s respectful and welcoming for the entire family. We offer a variety of services for patients of all ages, including dental implants, mini implants, dental implant crowns, bone grafting, same day teeth, and we even give out and receive dental implant coupons. If you’re seeking a South Bronx implant dentist to help plan your implant procedures, you’ve certainly come to the right place! Most patients receive their dental implants over the course of two separate surgical procedures. The first procedure involves the implants being placed within the patient’s jawbone, where they will provide a strong foundation for the replacement teeth. The second procedure involves the teeth replacements being molded and placed onto the implants, discretely completing the patient’s smile and allowing him or her to regain a normal appearance and normal functionality of the teeth. Curious about mini dental implants? As one would assume, these implants are smaller than normal dental implants, but also have two separate parts. They can secure most types of replacement teeth and can be placed and loaded in a one-day appointment. For more information about dental implants, give us a call at the office of Dr Darryl Lieberman. We’ll pair you with a South Bronx implant dentist who can help you better understand which dental solutions are right for you. This entry was posted in Dental Cleaning, Dental Veneers and tagged 10451, Dental Cleaning, Dental Veneers on February 26, 2018 by admin. If you want your teeth and gums to remain as healthy as possible, you should come to our dental practice, Dr. Darryl Lieberman, where you will receive excellent preventive dental care. Our patients are encouraged to have biannual dental visits, as well as to have a dental cleaning in Bronx NY every six months. When you come to our dental practice you will be seen by our top-notch dentist, Dr. Darryl Lieberman. 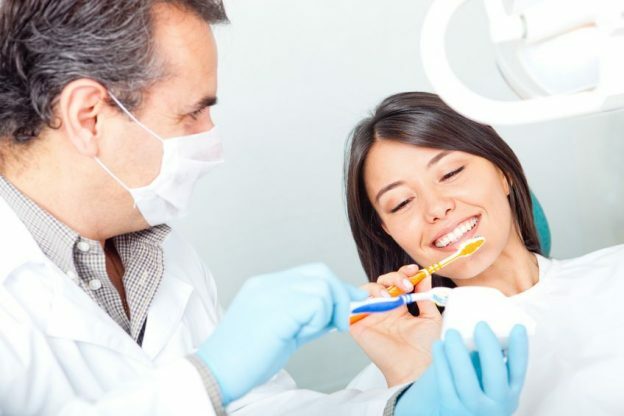 Many of our patients choose to arrange to have a dental cleaning in Bronx NY on the same day of the dental exam so that they will be able to have all of their routine dental work performed in one office visit. It is very important that you come in twice a year to have dental exams and cleanings to not only help your teeth remain healthy and cavity-free, but so that our dentist can find any dental problems while they are still small. Having biannual dental exams is actually cost-effective because it is much easier and less expensive to treat a dental problem while it is still small, rather than wait until you have a large dental problem that needs treatment. For example, our dentist can quickly fix a small dental cavity. However, if the dental cavity is never treated, it will eventually reach the center of the tooth and you will need to have a root canal treatment in order to save the tooth. During dental exams, the health of your gums will also be assessed; you will most likely be able to stop gum disease from developing if you have routine dental cleanings and exams. If our dentist finds that you have gingivitis, he will most likely recommend that you have several dental cleanings over the coming months to help your gums return to good health. During routine dental exams, your mouth will also be thoroughly assessed for any signs of oral cancer or problems caused by teeth grinding. For an appointment to meet with our dentist for a dental exam, or to have a dental cleaning in Bronx NY, simply contact our office. This entry was posted in Biannual Dental Visits, Dental Cleaning and tagged 10451, Biannual Dental Visits, Dental Cleaning on October 23, 2017 by admin.